Chris Alexander of Metalogical practices the lost art of blacksmithing. 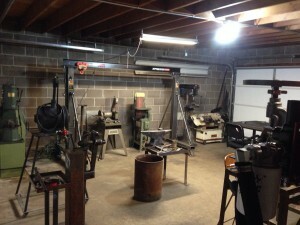 With the exception of a few power tools, his workshop is much like it would’ve been a few hundreds years ago when a blacksmith was a staple in every town. Chris wasn’t raised around a forge; he graduated with a Bachelor’s degree in History before developing an insatiable interest in the art. In addition to his business and Etsy shop, Chris skateboards, works on custom motorcycles, plays bass, raises chickens and has been practicing Muay Thai kickboxing for over a decade. I’m not making this up. Tell us about getting started as a blacksmith. I’ve had an interest in metal ever since I worked in a sheet metal shop making A/C ducts as a summer job between high school and college. I had a few careers before I discovered blacksmithing and joined the Rocky Mountain Smiths – the local ABANA chapter. I saw my teacher at the very first blacksmithing demo I attended; he made a hitch used for logging. The techniques he used were very difficult – and it was in front of a crowd, in someone else’s shop, with no power tools. It blew my mind. I saw he had an apprentice and thought “these guys have apprentices?” I met with him the following week and made a deal – I would apprentice but I had to be 100% committed to blacksmithing as a career and there would be no pay. Since then it’s mostly been learning on the job. I also became friends with another blacksmith when we were living in Florida. He has a lot more experience than I do and is a really great guy. I call him whenever I need advice and we bounce ideas back and forth – it’s a huge help. What type of machinery do you have in your shop? I’ve seen at least a forge, anvil, flypress, power hammer, welder, belt sanders, and finishing machines. It seems like a big investment! The amount of tooling you need to do this work is crazy. It’s a huge investment. Once you decide to do it for a living, finding an affordable place to work legally in the city is the next challenge – lots of zoning problems with all the noise and fire. I have everything you mentioned plus a 50-ton hydraulic press, a 2” thick steel layout table, saws, a drill press, a small crane, post vices, air tools, blacksmith anvil tools like a bickern and a hot cutter, the list goes on. I also make a lot of my own tools like tongs, chisels, and flypress dies. I bought my first basic setup over a month or two, but it’s been slow accumulation process since then. I waited years before getting the bigger machines. I’m finally mostly done, though, except for a few things that need to be replaced. 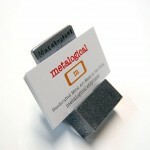 One of your selling points is that you make items that cannot be mass manufactured. What are your thoughts about Etsy’s new policy changes that will allow outside manufacturing? What buyers are looking for on Etsy is a closer connection to the product and its maker. They want to associate the product with a person and they want it to be unique. Of course, most of us use some parts that are mass produced when making our products – it’s very hard to do everything from scratch. I don’t make the steel nor the finishes for my buckles. However, my buyers know that I’m involved in the making of every piece. It’s hard to make a full-time living as a craftsperson, so Etsy has to allow some wiggle room in the policy to allow sellers to be successful. At the same time, a line must be drawn somewhere or Etsy will lose its appeal. That gray area is very hard to manage. Tell us the details about creating a single piece – how many hammer strikes go into one piece? How many times does it go back into the forge? It’s hard to say how many hammer strikes go into one piece. When I’m hammering during routine buckle making, at this point my arm is just over there doing its thing. I don’t have to think about it much other than making sure I’m doing everything smoothly and loosening my grip when I hit the chisel. 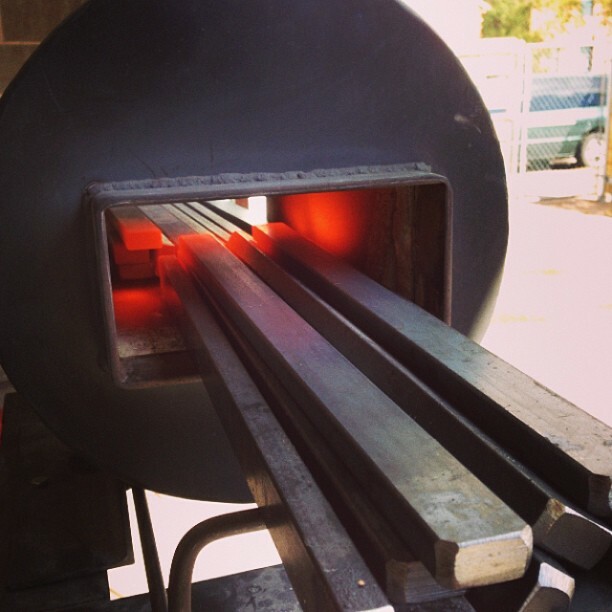 In blacksmithing, we measure forging time by heats. I can do the buckles in one heat when the forge is really hot, but I think it’s more efficient to forge them in two heats, which means they go back in the forge once. I make them in batches of 6 and sometimes forge up to 36 in a session. I can do more, but I feel it the next day if I get too ambitious. The rest of the process involves shaping the buckle in my flypress and on the anvil, welding the back on, and finishing. What challenges have you faced selling items for men on Etsy, a female-dominated site? 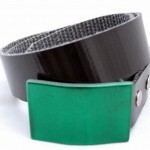 My buckles and belts are unisex, but they are geared more towards men since a lot of women prefer slimmer belts. Most of my customers are actually women buying gifts for men, so it hasn’t really been a problem for me. I’ve planned to design a line of slimmer belts and buckles for years, but I haven’t been able to sit down and put the time into it yet. I should get going on it – I’m sure I could sell more if I had better offerings for women. How have your hobbies helped your business? How did the partnership with the Surfrider Foundation get started? Partying and being a craft beer fan has helped for sure. I try to do other creative things besides my work. It’s important to try to come up with new ideas as often as I can, but things start to get boring if I’m only creative in the studio. Doing something creative that’s totally unrelated changes things up a bit and helps me see things from a new perspective. I’m not a surfer, but one of my childhood friends is a marine biologist and surfer who’s been working at the Surfrider Foundation for many years. 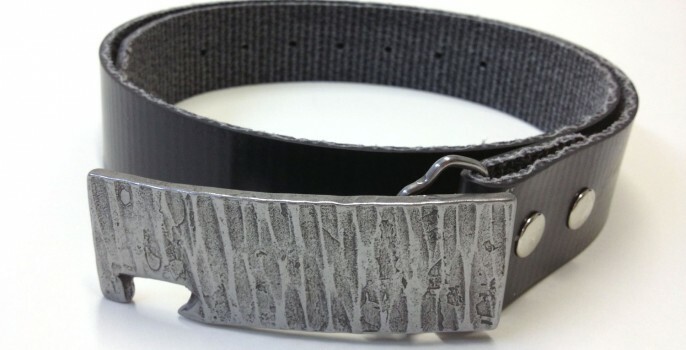 Originally, he just wanted a buckle with the Surfrider logo for himself and some friends – but everyone really liked them and Surfrider decided to start selling them along with my hemp belts. Surfrider is a great organization, I’m so happy to partner with them. It’s a wonderful feeling sending a box out and knowing the proceeds are helping preserve the world’s oceans. Your signature item is a belt buckle bottle opener – did you have any idea how big it would be when you first created it? How many beers were harmed in the testing phase? I started off on Etsy with a few belt buckles and a bunch of random things. I had no idea the belt buckles were going to take off. 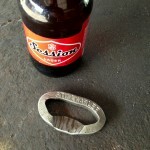 My first sale was one of my Simple buckles, but the bottle opener buckles pulled ahead fast. The first one I made worked well, so I probably harmed a lot more beers after I started making them – it was technically research and development. It’s a simple design; most of the improvements have been in my forging, welding, and finishing processes. What’s the most serious burn you’ve suffered from blacksmithing? How many t-shirts have you lost? I’ve learned to avoid the really bad burns, but I get burned almost every day. This stuff called scale comes off the steel when it’s hot and is always flying all over the place. As long as you have safety glasses on you’re good when working on smaller stuff, but I routinely get burned on my face, scalp, the back of my neck, even the inside my mouth if I forget to close it. My left forearm gets it worst because it’s closest to the metal and it’s often too hot to wear long sleeves. It’s embarrassing; my forearms are a patchwork of scars and I often have to explain when I notice people looking at them. A hand-modeling career isn’t in my future, that’s for sure! The worst one was when I was still learning and dropped a red-hot candle holder on my arm. I still have a big scar from that. I go through so many t-shirts that my mother-in-law grabs free or dirt cheap ones whenever she sees them, so I have all these random shirts I wear to the shop. I also wear my old t-shirts in the shop when they get worn out. Once they’re too destroyed to wear, I use them to strain my citric acid cleaning solution or they become a shop rag. Your items definitely have a Colorado appeal. Have you had much luck selling locally? Colorado has a great art scene – moving away for a while made me appreciate it more. Denver is a happening place to be, there are so many art districts. However, I don’t do many events or sell my products in stores right now. 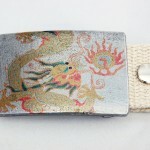 Belt buckles are something people have to be specifically looking to buy. I haven’t had a ton of luck selling at events, so I’d rather spend the time working on other projects and let the internet do its magic. I think being back in Denver has really put me on the map – I have a lot of sales in Denver and Colorado. My studio is located in an artist community (Studio 8) a few blocks from the Santa Fe Arts district, so I’m planning to tap into the local scene even more. We’re planning our first open studio/art sale right now and I’m always happy to have people stop by and check out my shop. A lot of customers now buy buckles on the internet and pick them up at the shop, and it’s always nice to meet them in real life. 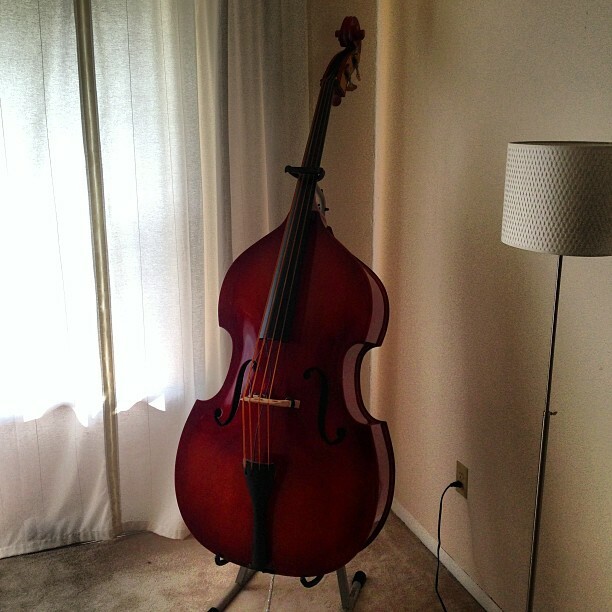 You have a Romanian plywood upright bass – have you started a rockabilly band yet? I’m still getting started on the bass. I used to play electric bass for a while in high school, so I have a bit of experience. I’m working with a teacher right now because the upright is kind of its own deal. We’re doing some rockabilly and a lot of classical. I definitely want to find a drummer and guitarist to play with soon. The only problem is I listen to obscure psychobilly bands, so it’s hard to find people into the same stuff. I like other types of music like punk, reggae, ska, and classic country, though. There are a lot of musical styles that sound good with slap bass and a healthy dose of punk rock. Chris isn’t shy about sharing his craft – check out his YouTube channel and website for videos of his blacksmithing in action. He’s also on Facebook and Twitter, posting shop pictures and works in progress. 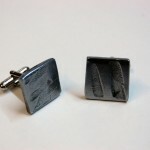 I recommend adding the Metalogical Etsy shop to your favorites for the next time you need that perfect gift for the man in your life.